Building a memorial to commemorate 3,000 lives lost on 911 was no small enterprise, but architects Michael Ara, Daniel Libeskind, and Peter Walker have constructed a fitting tribute. May 21, 2014 is the first day the 911 Memorial is open to the public. Student travel groups heading to New York City can now walk freely among the memorials and grounds where the World Trade Towers once stood. The 911 Memorial will be open to the public May 21, 2014. The memorial has twin reflecting pools, each an acre in size, centered by the largest manmade waterfalls in all of North America. The names of all the victims of the 2001 and 1993 World Trade Center attacks are inscribed into bronze along the lip of the memorial pools. This large undertaking is meant as a reminder of the largest loss of life from a foreign invasion in United States history. More than 400 trees were chosen and planted to convey a sense of physical regrowth and spiritual renewal at the site. All three award-winning architects are well known for their work on skyscrapers in Hong Kong, and parks and museums in Australia and the United States. Their most haunting achievement is the placements of names for the 911 Memorial, which are bronze stenciling hovering over the water. This is designed so paper can be pressed against a name for visitors as well as family and friends of the victims to make their own memorial rubbings. At night, light shines up through each name, a powerful reminder of those who were lost. When planning a student trip to New York City, trip leaders may want to consider booking a guided tour of the memorial. Memorial tours are walking tours provided by 911 survivors, recovery workers, lower Manhattan business owners and residents. Sometimes, 911 Memorial tours are even given by the victims’ family members. The personal stories mix with world news in a way that is a completely unique experience when students experience a guided tour of the memorial site. When visiting the 911 Memorial and Museum website you can view EarthCam webcams of the site. This is the perfect way to engage students ahead of time. In the museum you will have the opportunity to explore the topic with interactive digital displays of the 911 timeline. There is a separate page on the Memorial website specifically for teachers to prepare lesson plans, including foundational lessons, as well as a breakdown for different age groups. 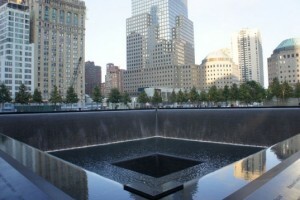 You can see these at this link: https://www.911memorial.org/lesson-plans. There are also teaching guides at this site, as well as tips on talking to children about 911 and webcasts for classroom visits and lessons. While visiting the 911 Memorial, President Obama remarked, “That’s beautiful.” The New York Times said former New York City mayor Rudy Giuliani would be the best person to take part in the opening ceremonies. So Giuliani was asked to introduce speakers that would include families of victims as well as many others who contributed to the project – such as the ground zero ironworker who built a Star of David from part of the wreckage. Few class trips will have students’ minds more captivated and interested than a visit to the 911 Memorial and Museum. It is strongly suggested that student tours to the museum (and 911 Memorial) are booked well in advance to reserve space and to schedule a walking tour. Tours will cover the exact grounds where history was made and have forever changed aspects of daily living in the United States and globally.